At this point in the season, you’ve probably assessed most of the new trends and decided on the ones you’re leaning into and which you’re leaving behind. If it’s looking like your wardrobe may need a major refresh, don’t panic. Frame’s Friends and Family sale is officially here, and it features the brand’s chicest styles for 25% off with code FRIENDS25. Shop the sale now until October 4. The perfect top for work and beyond. Take on the ’70s in this flared denim. Add to your bag ASAP. We love the hem on this pair. Give your black denim a twist thanks to this boot-cut style. Cropped denim flares aren’t going anywhere. Update the trend with this pair. Add a cardigan to make this top fall-appropriate. 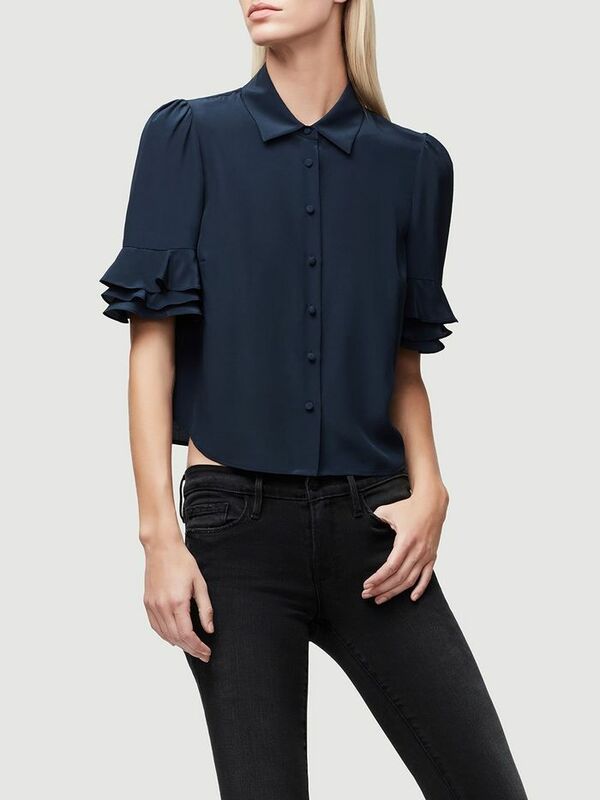 The ruffle details brings this chambray top up a notch. We love this dark wash.
Leather is our favorite staple trend for fall. This relaxed fit is a must-have. These jeans make your legs look miles long.